This week's Deal of the Week is the unlocked Motorola G4 Plus 64 GB LTE Android phone on sale for $184.99 at B&H. The G4 Plus launched at $299.99 last year. It has a Snapdragon 617 SOC, 4 GB of RAM, a 5.5" HD (1920 x 1080) Gorilla Glass 3 screen, fingerprint reader, SD card slot, 16 MP main and 5 MP front facing cameras. The phone is water repellent, supports quick charging and has a non-removable 3000 mAh battery. The G4 Plus launched with Android Marshmallow. A Nougat upgrade is available and Motorola has said that the phone will eventually receive Android Oreo. The G4 Plus is a universal phone that works on virtually all networks. If supports quad-band GSM, CDMA 850 and 1900, UMTS 850, 900, 1700, 1900 and 2100 and LTE bands 1, 2, 3, 4, 5, 7, 8, 12, 13, 25, 26 and 41. AT&T Prepaid (online only) free shipping on all phones and online-only discounts on most phones. Best Buy Free shipping on orders of $35 or more. 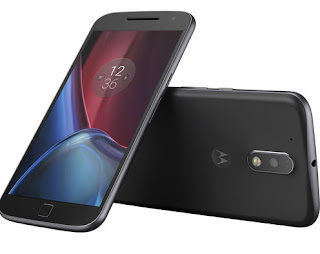 Free Phones for Port-ins: Free Moto E4, LG X-Power, ZTE Max XL, Alcatel Dawn, Samsung Galaxy J3 Emerge, LG Tribute HD, Kyocera Hydro Reach, LG K3, ZTE Warp 7 or ZTE Prestige 2 for customers who port a number to Boost from a non-Sprint based operator and activate it on the $50 plan. Ends 11/14. Used iPhone 6 16 GB 129.99 for port-ins and $179.99 for new activations and upgrades. iPhone SE 32 GB $109.99 for port-ins and $159.99 for new activations and upgrades. iPhone SE 128 GB $209 for port-ins and $259.99 for new activations and upgrades. 5 Lines of $50 Unlimited Gigs Plan for $100 Family plan promotion. New activations only, at least one line must be a port-in from a non-Sprint based MVNO or operator. 5 or fewer lines $100. Ends 11/30. iPhone SE 16 GB $99.99 (was $399.99), 64 GB $159.99 (was $449.99), 128 GB $259.99 (reg $499.99). Free and Discounted phones for port-ins: LG Fortune Free, ZTE Sonata 3 Free, Samsung Galaxy Amp 2 Free, Alcatel Streak 99¢, CPO Alcatel Pixi Theatre 99¢, CPO Samsung Galaxy Sol 99¢, CPO HTC Desire 520 99¢, CPO HTC Desire 625 99¢, CPO Alcatel OneTouch Flint 99¢, CPO LG Risio 99¢, CPO LG Spree 99¢, Alcatel PulseMix $29.99, LG Harmony $49.99, Alcatel Idol 4 with VR Goggles $49.99, LG X Charge $99.99, ZTE Blade X Max $99.99, LG Stylo 3 $129.99, when you port your number to Cricket. Unlocked Nextbit Robin 32 GB LTE Android phone (new) $120.00 Free shipping. Unlocked GSM iPhone 5s 32 GB (manufacturer refurbished) $159.95 Free shipping. Unlocked T-Mobile LG G5 H830T 32 GB LTE Android phone (new) $209.99 Free shipping. Verizon (or Verizon MVNO) Samsung Galaxy Note 4 N910V LTE Android phone (manufacturer refurbished) $149.95 Free shipping. Verizon (or Verizon MVNO) Samsung Galaxy S5 G900V LTE Android phone (new) $159.98 Free shipping. TracFone LG Sunset (AT&T) triple-minute LTE Android phone with 1200 minutes, texts and MBs of data, one year of service, case and car charger $79.95 (reg $99.99 w/o airtime) $6.95 shipping. TracFone Samsung Galaxy J3 Luna Pro (Verizon) 16 GB LTE Android phone with 1200 minutes, texts and MBs of data, one year of service, case and car charger $89.95 (reg $89.99 w/o airtime) free shipping. Kroger in store only, deals require a Kroger Shoppers Card. Two Lines of Unlimited For $80 Promotion: Additional lines of the $50 unlimited plan are $30 per month for two or more lines. 2 lines for $80, 3 lines $110, 4 lines $140, and 5 lines are $180. Plan includes unlimited voice messaging and high speed handset data. Video streaming at up to 480p. No tethering. Available in stores only. $30 Add A Line also available with the $30 2 GB, $40 5 GB or $60 unlimited plans. Four Lines of Unlimited for $100 Promotion: Four lines of the $50/month unlimited talk, text and LTE data plan for $100. Three lines are $90, two lines are $80. At least one of four lines must be a new activation. Free Phones for port-ins The Alcatel Fierce A30, Coolpad Defiant, LG Aristo, LG K20 Plus, Motorola Moto e4, Samsung Galaxy J3 Prime, Samsung Galaxy J7 Prime, ZTE Blade Z Max andZTE Avid TRIO are free when you port your number that's not currently active on T-Mobile network to MetroPCS. In stores only. 20% off phone plus airtime bundles with code ST20OFF. Free phones, iPhone 8, Samsung Note 8, Samsung Galaxy S8 and S8 Plus excluded, $100 maximum savings. TextNow Wireless airtime purchase ($19.99 and up) required. Free shipping. Walmart Shipping $5.99. Free shipping on orders over $35. Updated 11/2: New items and price cuts since Sunday are in bold. Anybody know if you have to buy airtime on at&t prepaid with the phone online? I don't think AT&T's website will let you get to checkout without putting in some airtime. But you might be able to remove the airtime at the checkout page. However, I find that AT&T's website often has a mind of its own, so YMMV. When you buy a prepaid phone or SIM from the AT&T site you are forced to chose a plan. An airtime card for the plan you choose gets added to the your cart but you can remove the card at checkout. Where is the texting dictionary on this page? YMMV? I see a lot less comments here this week. I have seen an ad pop-up when one moves mouse arrow toward a top corner to back out.....is this malware? I've seen pop ups on the site but they all have a prominent X to close button. I haven't seen a pop up that moves. Do you recall what it was advertising? I thought clicking on the prominent X of a pop-up ad to close opens one up to the malware. I normally back out of the screen the pop-up occurs on. The one here has about 8 or 9 categories related to phones/plans to click on, but no company name appears on pop-up. It appears on first article being read on this site. Normally never see any pop-ups here, but it's been a regular occurrence here for past month or so. The slog until Best Friday continues. thanks to dennis, i learned today on this site that the mysterious huawei elate, on cricket, which got pulled from the shelves at best buy due to a " software issue' , is now in stock at target. so, i went and got one. First time I tried to say that, I sounded like Elmer Fudd: "Waw-way Ewate". having used the new huawei phone for a day, it is a fantastic phone. lte ,sound, and screen are all great. fabulous design, and ALL FOR JUST $65. OCTO CORE PROCESSOR AND 12 MGP CAMERA ARE ALL GOOD. why spend more on apple and samsung overpriced junk. let the cult fanboys waste their money. "why spend more on apple and samsung overpriced junk. let the cult fanboys waste their money." Sorry, Mr. Huffy-3-Speed-Is-As-Good-As-A-Lexus, people actually buy the much better Samsung and Apple phones not because they are "fanboys", but because the phones are a lot better. Did the 5 unlimited line promotion for $100 on Boost end already? Are the in store free phones on Boost still ending on 11/? 5 lines for $100 ends Nov 30. The free phones for switchers offer is due to end Nov. 2, but I suspect it will be extended. BLU S1 on sale at Amazon for $130, black only. Gold still $180. Call Sprint for a free SIM card or order it through your local Sprintvrepair center or corporate store. These are nice phones, between entry and mid-range. They perform well. Cons are speaker volume and screen that is half-HD, not sharp and vivid much of the time. Voice commands, fingerprint sensor and FM radio are pluses. This might be the last day to order a free “year” of Sprint Unlimitrd BYO postpaid service. Not clear from promo page. ~11 months service if you order today. Sprint extended the Free Year BYO Unlimited offer. Sign up now and get free Unlimited postpaid service through 1/31/19. Just pay about $3/month in taxes. Sprint also fixed the BLU eligible phone to read S1/VIVO S instead of VIVO S (no such phone; only the S1 works on Sprint). Do at&t prepaid smartphones require a higher service level? I currently have my old landline on an at&t flip phone. Costs me about $25 for 3 or 4 months service. I'm tempted by the iPhone SE ... could I just move the sim over? The goal would be to have an unlocked IPhone after six months. You can't use Fi unless you buy a compatible phone or borrow a MEID to activate service. You need an AT&T smartphone plan to use your SE. Will cost you $150 minimum, and you could sell your SE and buy an unlocked one for less than that. You can also forget about unlocking and use FreedomPop LTE free plan on your SE. You can port your phone number in for $10 I think. Make sure you sign up for the $1.99 optional service so you can call CS if you have problems the first month. Then you can cancel the option if you want. If this is a hassle, just sign up for the Red Pocket special for $52/year. 100/100/500/mo. Should work since you have iMessage service that only uses mobile data (when off WiFi) for iPhone messages. at&t prepaid phones can be used on gophone, cricket, and any mvno using at&t towers. you can even tracfone it if you get an at&t tower sim card from them. Anon at 10:39: thanks for the info. 1. My son has a Nexus 6 that I could potentially use for 15 minutes to setup Fi. 2. I don't have an iPhone currently or ever. I slightly want one (TMO wifi calling, IOS, I have other Apple gear and generally like it). I started looking at 5c's earlier this year (~$80 used), it rapidly became apparent that those were becoming obsolete, and 5s's (~$100) were needed for latest IOS. Then I saw I could get a Gophone SE for $140. But I would want to use it on TMO long term, so it needs to be unlocked. If I need to put a $35 smartphone plan on it for six months, it isn't worth it to me. 3. I've been reading about Freedom Pop for at least five years. Based on my understanding of their business practices I won't do business with them. Too much hassle for me. (need to closely monitor account to make sure they aren't cramming things) Sounds like it works for you, good. 4. You mention an unlocked SE for less than $150, you are talking a used one right? Again, too much hassle for me. Maybe also 16GB? 5. I'm currently using Teltik/TMO for $23 per month. My G4 Play doesn't support wifi calling, would like to have that option. I'll wait until more 600MHz phones are released. I had a smartphone on AT&T Prepaid earlier this year, and the pay as you go plan appeared as an available option for smartphones (without data; only voice, SMS, and things that work over wifi will work). Regarding Google Voice, it's possible the number is in an area that isn't serviced by the company they use to manage phone numbers, but that's just a guess. The assessment of FreedomPop is correct as I have used them before. Also, it's not AT&T Prepaid so my understanding is service on FreedomPop will not count towards unlocking an AT&T Prepaid-locked phone. Also remember you can get a new and unlocked phone by buying one outright at full price, but you probably knew that. That was my thought, could I just use my flipphone AT&T Prepaid sim (at about $7/mo) in the SE for six months, and get it unlocked? Or do you have to buy the expensive smartphone plan times six months (over $200). RE Google Voice: the weird thing is that 3 or 4 years ago, I made it past that screen to port my number. So at least at that time, it was serviced. I just couldn't decide to spend the $20 porting fee at that time. If only I would have known it wouldn't work later, I would have jumped on it. Furthermore, last I checked, my number would port into Google FI. So do they use a different company for FI vs Voice? Virgin Mobile offers the Apple iPhone 6 32GB in Space Gray for $199.99. New price low for iPhone 6 from any carrier. Can't find a phone you like this week? Done of them are unique enough for you? Micro Center beats Amazon and eBay prices on the LeEco Le S3 X522 32GB GSM by $8.01 at $129.99 but you will probably pay sales tax, which may wipe out most of the savings. You are still better off with the Deal of the Week, Moto G4+. LeEco S3 is faster, has 16 MP camera and aluminum body, but the camera doesn't take very good pictures; the UI is clumsy; and it doesn't work on CDMA networks. HTC U11 life launched today on T-Mobile. Very nice mid-range phone, similar specs as Moto X4. Sells for $300, $50 less than expected. This is a better buy than the Moto X4 IMO. Squeezable sides for quick access to functions. To get the $300 price you need to pass a credit check, enroll in an EIP (equipment installment plan) and buy a $25! SIM. In addition a "$20 upgrade support charge may be required". I think you would be better off buying the phone unlocked from HTS for $349. You can pick the "Pay In Full" option under "Payment Options" menu if you don't want to sign up for EIP. A new customer does not pay the $20 upgrade charge. An unlocked phone does make sense if you don't want to use T-Mobile, or you have your own T-Mobile SIM card.